The NEW Floral Affection and Affectionately Yours Designer Paper Creates Opportunities for Beautiful Cards! This weeks' challenge highlights the beautiful 2016-2018 In Color Collection. There are NEW colors in the 2016 Annual Catalog! I love the ability to create beautifully bright vibrant fun colors for festive themes and the softness of the hues to create beautiful flowers! Wow, these colors are great for any occasion! This card was created with the New Floral Affection Textured Embossing Folders and the New Affectionately Yours Designer Series Paper. 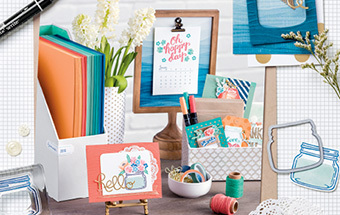 The images coordinate together to create beautifully designed cards that are easy to make! The Rose Wonder Stamp Set was used to create the sentiment tag. The New In Colors used for this card are Dapper Denim, Emerald Envy and Flirty Flamingo. I would like to show you how easy it is to create this beautiful card by using the simple paper folding and inking techniques! So, let's get started by cutting two 6 1/4 x 5 Dapper Denim Cardstock, two 3 x 4 Flirty Flamingo Cardstock, two 2 3/4 x 3 3/4 watercolor paper, and 2 x 12 and 1 x 6 1/4 Affectionately Yours Designer Series Paper. Sponge ink Floral Affection Textured Embossing Folder with Flirty Flamingo and Emerald Envy on watercolor paper. Wipe off edges of images with a baby wipe. Put through Big Shot Die Cutting Machine. Repeat technique for inside of card using the other image in the set of Floral Affection. To create the pleats with Affectionately Yours Designer Series Paper I couldn't decide which pattern to use so I am showing you both sides! I love this technique because it is so easy to create beautifully coordinated colors and images. It is already done for you! Take the 2 x 12 strip and measure 1/2 of the width of the card. Notice with this design there are natural columns to the design. This makes it so easy to create even pleats by folding like a accordion every other column starting from the 1/2 way point. The 1/2 way fold is your marking for the start of your angled cut to 1/4 from the top. Fold in the accordion to show the other side of the designer paper. Adhere folded paper to matted cardstock and add 1/2 x 6 1/4 strip showing the other side of the designer paper. Add 1/4 Crème Satin Ribbon, mat embossed watercolor paper to Flirty Flamingo cardstock and adhere with stampin' dimensionals to base of card. To create sentiments, stamp outline and sentiments of tag with Rose Wonder Stamp Set in Dapper Denim and die cut with Rose Garden Thinlets. Mat Affectionately Yours Designer Series Paper 1 x 6 1/4 to Dapper Denim cardstock. Add sentiment tag to matted embossed watercolor paper to Flirty Flamingo Cardstock. Add sentiment tag with stampin' dimensionals and Rhinestone Basic Jewels to front of card.